(Nanowerk News) Mantis shrimp are available in the lab and can be photographed or videoed. A video that media are free to use is here: https://www.youtube.com/watch?v=_8K3bx42jVM -- The next generation of airplanes, body armor and football helmets crawled out from under a rock--literally. Their latest research, to be published in the journal Advanced Materials ("A Sinusoidally Architected Helicoidal Biocomposite"), describes for the first time a unique herringbone structure, not previously reported in nature, within the appendage's outer layer. It is this tough herringbone structure that not only protects the club during impact, but also enables the mantis shrimp to inflict incredible damage to its prey. Mantis shrimp in the lab of David Kisailus at the University of California, Riverside. Kisailus studies the structure of the fist-like club of the mantis shrimp to develop tougher and stronger materials. 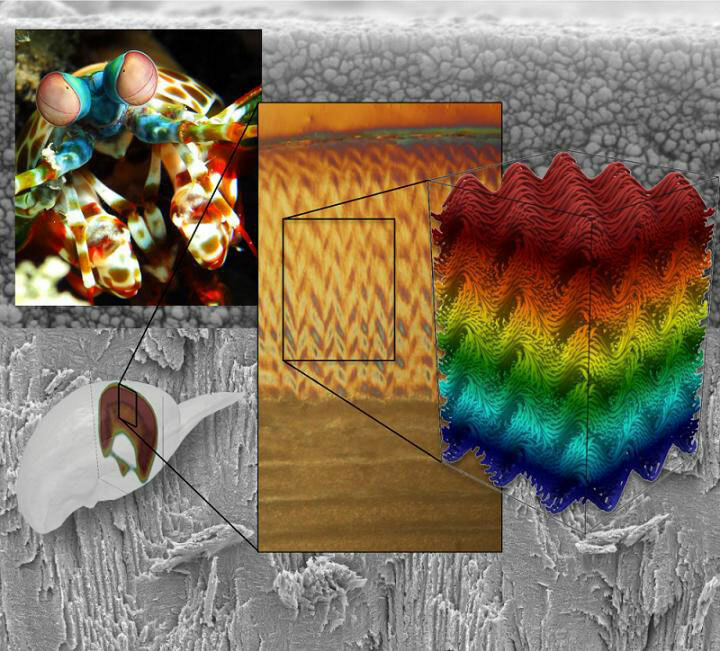 In previous work, including a 2012 study published in the journal Science ("The Stomatopod Dactyl Club: A Formidable Damage-Tolerant Biological Hammer"), the researchers identified several different regions of the dactyl club, including an interior region--called the periodic region--with an energy-absorbent structure that also filters out damaging shear waves, which travel through objects when they are under stress. This energy absorbing "periodic region" consists of two phases: an organic phase made of chitin--a compound found in the shells of insects and crustaceans--arranged in a helicoidal structure that resembles a spiral staircase, and an inorganic phase comprising amorphous calcium phosphate and calcium carbonate. Zavattieri and his student Nicolas Guar?n-Zapata built computational models that replicate the local details of the herringbone structure. These models explained that damaging stress can be more uniformly distributed, mitigating catastrophic structural failure. Compression testing of the 3D printing biomimetic composite also helped prove that the herringbone structure makes the impact region even more effective than the periodic region in redistributing stress and deflecting cracks. "While the computational modeling results gave us compelling confirmation of the redistribution of stresses in these structures, the "wow" moment came when we tested our 3D printing samples," Guar?n-Zapata said. "The smasher mantis shrimp has evolved this exceptionally strong and impact-resistant dactyl club for one primary purpose--to be able to eat. However, the more we learn about this tiny creature and it's multi-layered structural designs, the more we realize how much it can help us as we design better planes, cars, sports equipment and armor," Kisailus said.